Stay Radisson Hotel when visiting local government offices! 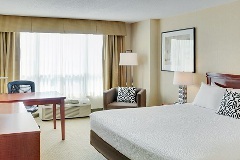 Radisson Hotel Kitchener Waterloo offers guestrooms with one king or two queen beds with a fridge and microwave—100% non-smoking. The Radisson Hotel is ideally located in the heart of the Waterloo Region, just minutes away from the downtown core and Communitech. Make your online reservation or call +1 (888) 333-3333.